It's a fine time to make wine! Bud break is starting around the county, reminding us that harvest is just a few months away! 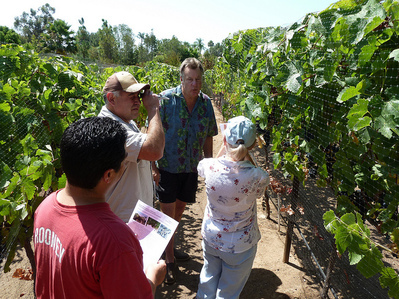 If you have aspirations to make your own wine from fresh grapes this year, you might want to join our Grapes to Glass Hands-on Harvest course. Or, if you just need to know what to do with your grapes this harvest we also have a seminar-only Basic Winemakine series to help you make award-winning wines on your own. Don't forget to enter the Winemaker Magazine homemade wine competition, entries are due in by March 16th! Entries for the San Diego county fair homemade wine competition will due soon in May, we will have more information on entering in next month's newsletter. Spring officially arrives this month -- celebrate with a batch of yummy fresh homemade feta! Tangy, briny feta can be made with regular cow's milk from any grocery store. The tanginess in the cheese comes from the addition of lipase, an enzyme that releases fatty acids from the fats in milk. Lipase can be added to a variety of cheeses to add a tangy flavor, including mozzarella and queso fresco. Add calcium chloride to milk. Heat milk to 90°F over direct heat. Turn off heat and mix in direct set cultures. Cover and let sit for 45 minutes; remember to reconstitute the lipase powder in water at about 25 minutes in. Heat milk to 96°F. Stir in lipase, then add rennet and mix in gently but thoroughly. Cover the pot and let sit until a clean break is achieved, approximately 1 hour. 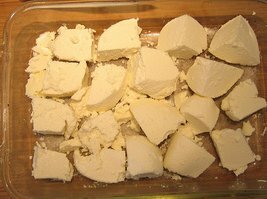 Cut the curd into ½” cubes. Let curds rest for 5 minutes, then gently stir every 10 minutes for 1 hour, heating if necessary to hold the temperature at 96°F. Put coarse cheesecloth into a colander over a large pot. Pour the curds into the colander and let the whey drain out for 30 minutes. SAVE 1 quart of whey for brining, store in the refrigerator. 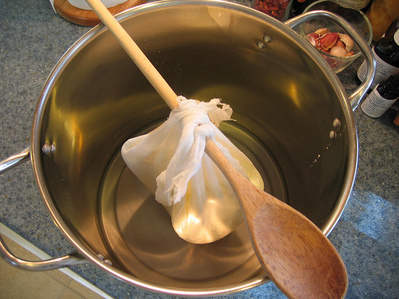 Pull the ends of the cheesecloth together and hang for about 24 hours at room temperature. The next day cut the curd mass into 2” to 3” chunks. Arrange in a single layer in a container and sprinkle with salt. Cover tightly and let sit at room temperature for 3 days. Every day pour off extra whey, turn the chunks and resalt. After 3 days mix 2 oz. of kosher salt into the reserved whey, warmed to room temperature. Carefully pour the brine over the feta and move to the refrigerator (not cheese locker, but your regular refrigerator). Cover store for 1 to 4 weeks; the longer it is brined, the more crumbly and salty it will become, and the flavor will continue to develop as well. Join us Saturday March 24th at 1 pm to see how fast and simple the Vinmetrica analyzers are to use to test your homemade wines. 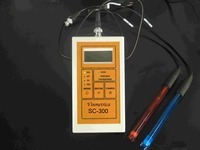 Rich Sportsman, founder and owner, will introduce you to his newest titratable acidity/pH meter the SC-200, as well as a new sulfite/TA/pH combination unit the SC-300. Rich will demonstrate how to use these analyzers, and participants are invited to bring one sample of wine for testing (30-50 mls) at the demonstration. All participants will be offered 10% off Vinmetrica products immediately following the demonstration. If you are interested in purchasing an SC-100, SC-200, or SC-300 analyzer, please feel free to contact us to hold an order for you so we have enough in stock (payment is not due until final purchase). This month we have a wonderful white blend released from Cellar Craft, Sauvignon Blanc / Semillon / Chardonnay blend from Yakima Valley, Washington. We will email you when these kits arrive if you pre-ordered them already. If you did not and are interested in any of these special wine kits, please contact us, we do have a few extra ordered. Please note, these kits are for in-store pick-up only! Although the grapevines are just starting to bud, we are already preparing for Harvest 2012 at Curds and Wine! We will be offering two sets of Winemaking from Fresh Grapes Courses this year, the Basic Winemaking from Fresh Grapes 3-seminar series as well as the Grapes-to-Glass Hands-on Winemaking Course. Seminars will begin in June and continue through August, with Hands-on classes extending through October. Space in these courses are very limited and are going quick, so reserve your spot today! Join us at Curds and Wine to learn how easy and rewarding it is to make your own cheeses at home! At this class you will learn t he fundamental processes behind fresh cheesemaking as well as the techniques for making pressed cheeses and aged cheeses such as cheddar, gouda, and camembert. 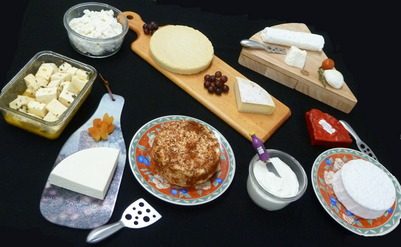 We will make fromage blanc, ricotta, and queso fresco, and demonstrate the processes involved in making feta, swiss-style cheeses and mold-ripened cheeses such as camembert/brie-style and blue cheeses.. We will have samples of the various styles of cheeses you can make at home from Venissimo, as well as other refreshments. Finally, you will receive a packet with a recipe booklet to make the cheeses from the class as well as basic supplies to get you started with your cheesemaking. You will also receive a 10% discount on any purchase in the shop following the class. The fee for this class is $65 per person, and class size is limited to 12 participants. These classes sell out fast! If you would like to check for an opening or to be put on the waiting list for this class, call the shop or email us. These are the last cheese classes at Curds and Wine until November. Queso Diego in the News! The San Diego Reader recently wrote about the San Diego Cheese Club, Queso Diego. Read the article here. The club meets every third Tuesday of the month, sign up for the email list to get the location and meeting topic or check back at the website or Facebook page for details.